The 122nd China Import and Export Fair, one of China's largest trade fairs, concluded in Guangzhou on Nov 4 with export turnover reaching 198.6 billion yuan ($30 billion), up by 8.2 percent year on year. According to Xu Bing, the fair's spokesperson, the total number of buyers that attended the event reached 191,950, an increase of 3.36 percent year on year. More than 36,500 of the buyers have been to the Canton Fair for more than two times, a 4.22 percent year on year increase. Registered buyers from countries involved in the Belt and Road Initiative reached over 84,000, up by 3.48 percent. The 122nd Canton Fair concludes in Guangzhou on Nov 4 in Guangzhou. The top sales at the fair included mechanic and electrical products, with transaction volume reached nearly 16 billion yuan, an increase of 5.4 percent compared to the 121st event. "The steady growth in China's foreign trade is expected to continue, on the premise that no major risk events would happen," according to Xu. Xu added that the increase in terms of the number of buyers and turnover of the fair showed the effectiveness of Chinese foreign trade companies in regards to business innovation and economic restructuring. The export volume to countries involved in Belt and Road Initiative including Russia, India, Malaysia and Thailand reached nearly 9.4 billion yuan, up by 13.6 percent year on year and accounting for 31.1 percent of total transaction volume. China Import and Export Fair, also known as Canton Fair, is held every spring and autumn in Guangzhou. It is widely seen as a barometer of China's exports. More than 160,000 types of products manufactured by approximately 25,000 companies were exhibited in some 60,000 booths at the fair. And a large proportion of the exhibits at the fair included smart, low-carbon and customized products of local brands. 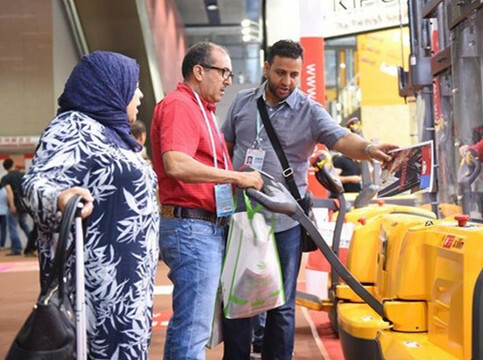 More than 2,000 domestic manufacturers attended the event with their own brands, many bringing their state-of-the-art products. Foreign buyers pick out forklift at the China Import and Export Fair, also known as the Canton Fair, in Guangzhou on Oct 15. A foreigner selects an electrical kettle at the 122nd Canton Fair.